My friend bought Sony HDR-CX350 as a full HD camcorder with super imaging. However, when she attended to load the AVCHD files from the CX350 camcorder to iMovie 8, but iMovie does not read the .mts files. I recommend her to upgrade to iMovie 9, which might work with the CX350 .mts files. However, no matter you record HD videos using FX mode with 1920x1080i 24Mbps, or FH moded with 1920x1080i 16Mbps with saving to Memory Stick Duo or SD/SDHC/SDXC memory card, you may find it difficult to import AVCHD files to iMovie without the camcorder connecting to iMac/MacBook Pro or even Mac Pro. Aunsoft MTS/M2TS Converter for Mac comes as the perfect solution for you to import Sony CX350 AVCHD files to iMovie even if you do not have the camcorder beside you. Well, here is the step-by-step guide for you to edit Sony CX350 MTS videos in iMovie with HD quality, taking iMac with Mac Snow Leopard as an example. Step 1. Add Sony AVCHD video to Aunsoft MTS/M2TS Converter for Mac. After transferring .mts files from Sony HDR-CX350 memory card to iMac Apple hard drive, run Aunsoft MTS/M2TS Converter for Mac as the best Mac Sony AVCHD converter, and click the "Add" button to load the 1080i .mts videos. You may also import the AVCHD files with drag and drop. Click the "Format" option and choose Adobe Premiere/Sony Vegas > MOV (AVC)(*.mov) as output format for importing to iMovie 8 and iMovie 9. The Mac Sony AVCHD to iMovie converter will transcode MTS to MOV for Mac applications with original video resolution, e.g 1920x1080. Step 3. 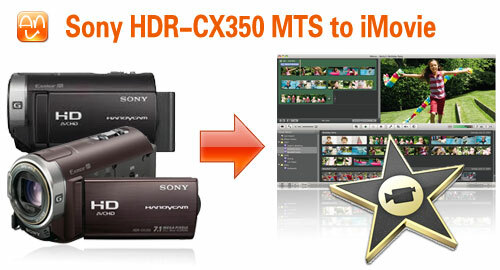 Convert Sony CX350 MTS to MOV for iMovie. Click the convert button on the bottom right corner, and the conversion from Sony CX350 MTS to HD MOV will begin right away. After the conversion is done, you can easily import HD videos to iMovie 8 and iMovie 9 for editing, uploading to YouTube or presenting on iPad. If you have other Sony camcorders and would like to see more solutions to deal with camcorder videos, just check out the Sony camcorder column.